On Tuesday the ABS released December quarter property price data revealing that established house prices across the nation's capitals fell by 5.5% throughout 2018, faster than any twelve month period - including during the GFC. Our wire in December (‘How far is housing from fair value?’) analysed a few different valuation methods. 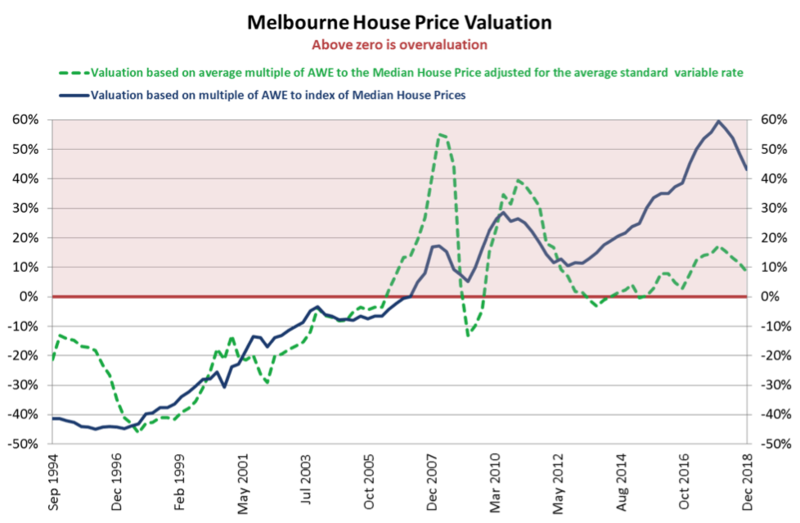 The most basic of these – the ratio of the median house price to annualised average weekly earnings (AWE) – suggested that despite recent falls, housing nationwide was still more than 30% overvalued. Another measure, which takes into account changes in home lending rates implied that residential property prices were close to fair value. How have these valuation measures changed and how do Australia’s capital cities compare? The analysis suggests that one city in particular still has a particularly long way to fall. We reiterate that we are not anticipating an economy-wide collapse in house prices, which would likely require an increase in unemployment and lending rates. According to the ABS, nationwide established house prices peaked in December 2017. However, prices in some cities were slow to rise and may not yet have peaked, while others peaked during the post-GFC mining boom nearly five years ago. 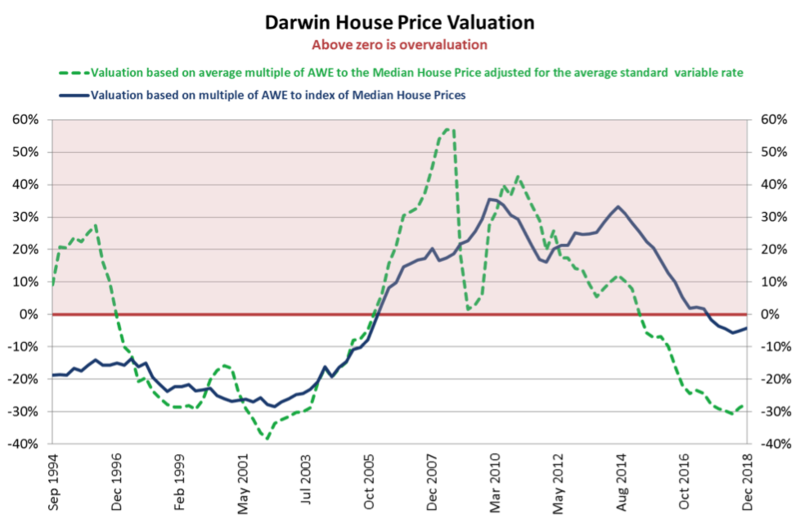 Exhibit 1 depicts the average of median house prices nationwide and compares this to annualised AWE using ABS data going back to August 1994. For a discussion of why the average has changed dramatically over time see our December wire (‘How far is housing from fair value?’). The multiple now stands at 7.80x annualised AWE. The long term average since 1994 is 6.18x and can be loosely thought of as an indicator of fair value, which is depicted by the bolded line spanning the 0% axis. 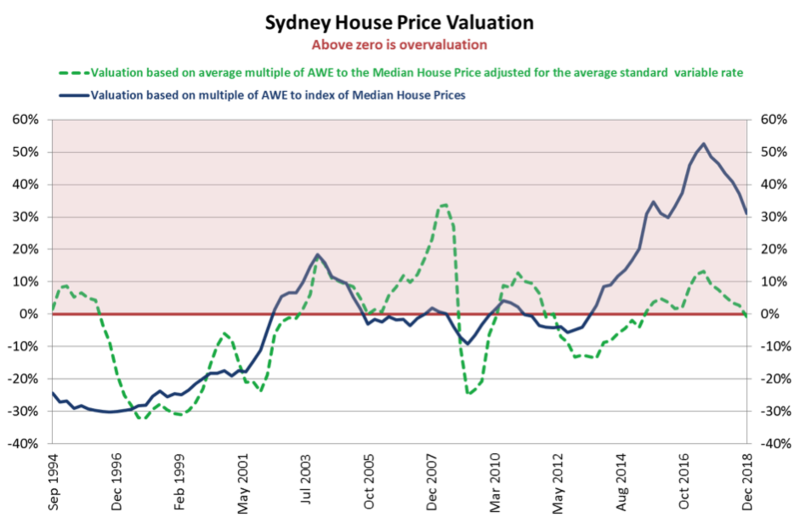 On this basis, housing is currently 26% above the average (see the blue line in Exhibit 1). Once changes in home lending rates are taken into account this gives a very different perspective. 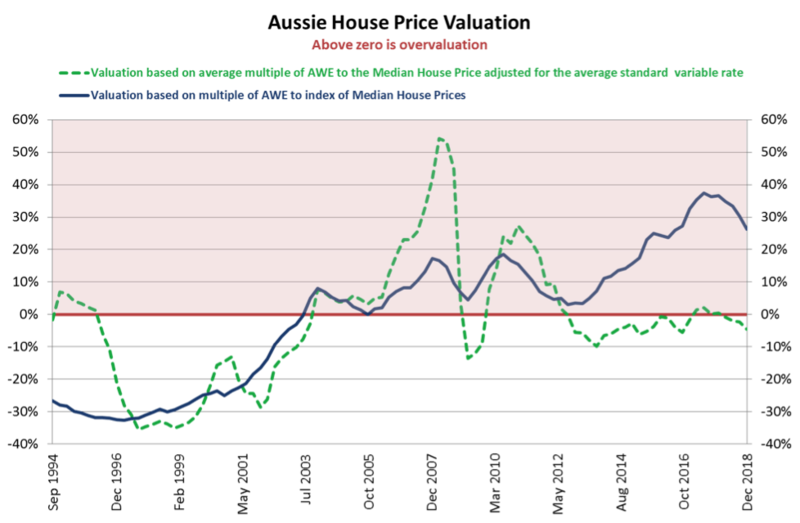 The hashed green line in Exhibit 1 above shows what happens when the ratio of the median house price to annualised AWE is adjusted for changes to the standard variable home loan rate. This is a more volatile measure, but is relevant to Australia due to its relatively low level of fixed rate home loans. When lending rates were being raised in the years leading up to the GFC to as high as 9.6% p.a., all else being equal, the impact was to lower fair value. By this simple measure, nationwide housing reached peak overvaluation in mid-2008. In other words, had the lending rate remained at 9.6% p.a. and earnings growth stalled, then over time the estimated nationwide median house price could justifiably have come back by more than 50%. The average standard variable home lending rate since 1994 is nearly 7.1% p.a. With the standard variable home loan rate now back at 5.35% p.a., this methodology suggests that nationwide housing is currently 5% undervalued. This demonstrates the sensitivity of Aussie house prices to changes in interest rates, where the data shows that prices skyrocketed during periods of rate cuts and when there were expectations of further rate cuts. How do prices compare across our eight capital cities? Exhibit 2 tabulates established house price valuations in the nation’s capitals. These valuations take into account ABS property price data for each capital city and ABS earnings data by state or territory. 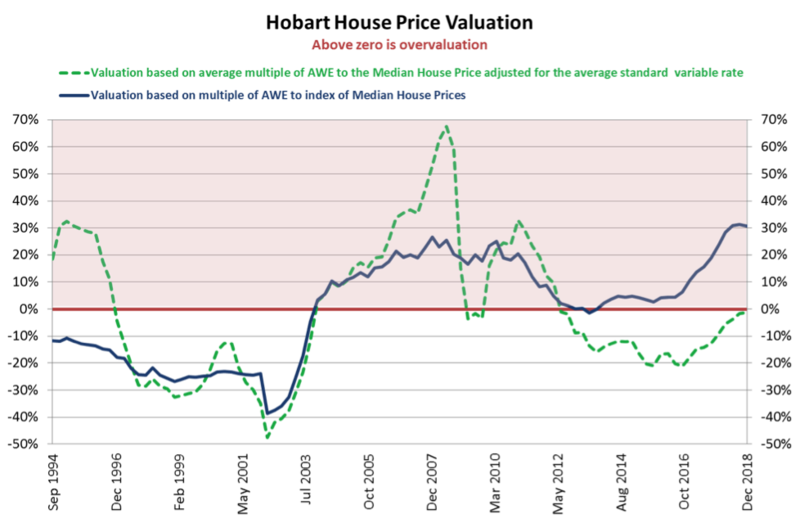 Perhaps the most obvious data points relate to Melbourne, which, by these measures is far and away the most overvalued capital and the only city to exhibit overvaluation when adjusting for home lending rates. Also worth pointing out is that Sydney and Hobart are the next most overvalued cities when only taking into account price-income multiples relative to long term averages. For Hobart, this is likely being driven by strong population growth and a lack of housing supply. It would seem that sky high prices have driven many out of the Sydney and Melbourne housing markets. Overpopulation in the main capitals has also led to many seeking certain lifestyle changes that are perhaps only attainable in Tasmania. We also note that commodity-price-sensitive Perth and Darwin screen as slightly undervalued by the most basic measure and clearly undervalued when taking into account current low home lending rates. Finally, we draw attention to differences in the long term average price-income multiples for each capital city where both Darwin and Canberra exceed Melbourne. Only Sydney has historically been prepared to pay double-digit multiples for established housing. 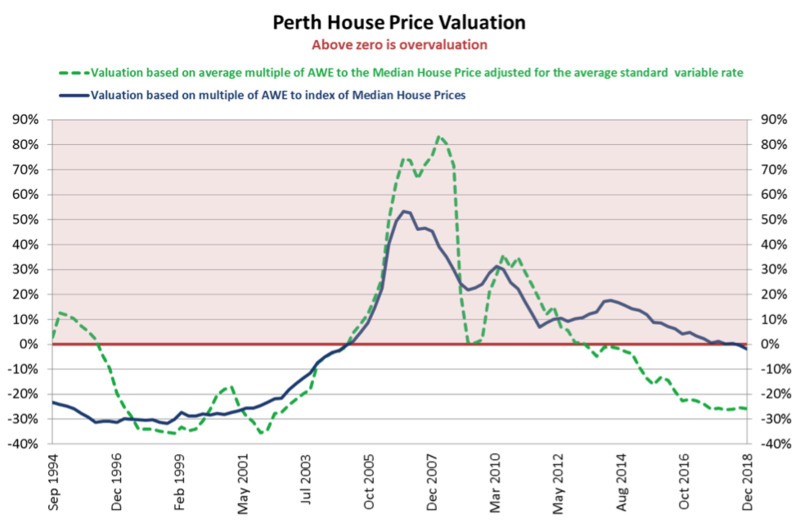 Sydney-siders currently fork out nearly 11x annualised NSW AWE to buy the median established home. That equates to immense pressure on first home buyers in our largest capital. The simple analysis presented in this note demonstrates that housing valuations by capital city are wide-ranging. If lending rates stay low (along with unemployment rates) there is unlikely to be a huge crash. However, if history is anything to go by, Melbourne perhaps has the furthest to fall even though Sydney easily trades at the highest multiple. Meanwhile, bargain hunters could become increasingly attracted to the Darwin and Perth housing markets. We provide valuation charts such as that in Exhibit 1 for each capital city below. 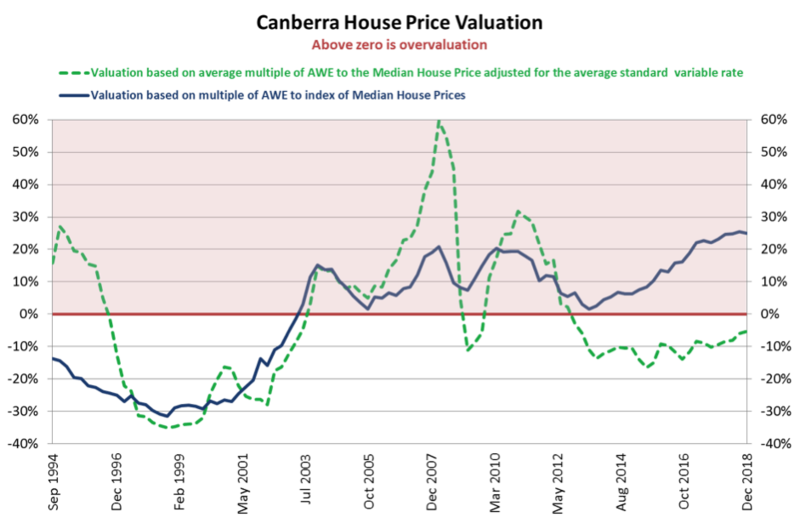 Static measurements of asset valuations are seldom accurate given that money supply is a function of debt growth. If no one is expanding their balance sheet and generating M2 cash then jobs growth will inevitably decline. Current levels of unemployment are a lagging indicator and should probably not be relied upon. Add negative gearing changes and it's easily foreseeable that valuations can trade far below long term averages. Hi Tyler, Would Exhibit 2 suggest you're a buyer after another 23% is washed off the Syd market? @PETER RIDDELL - I was thinking the same, but equivalised disposable household income in "6523.0 - Household Income and Wealth" data is only released every 2 years. Do you know of a more regular and up to date source?